Hey guys, CommanderAnder and TacoFangs (CommanderFangs?) here to talk about Sector Space! We're all super excited to finally see the walls come down and let you guys fly around the Alpha, Beta and Delta Quadrants uninhibited. There's a lot to cover, so let's just dive into the meat of it. 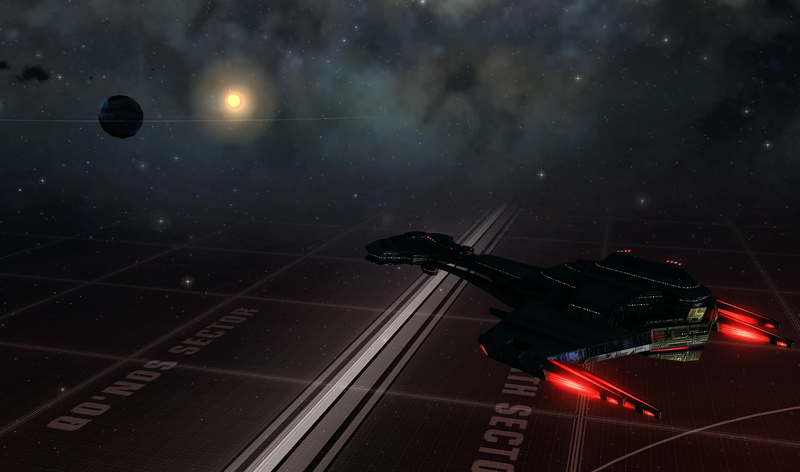 The Delta Quadrant will still be accessible via the same method as before, by using the Gateway in the Jouret System. The Alpha and Beta Quadrants are separated by the Traffic Controller contact, the same way all of the old sectors were. So you'll fly up to the border of the sector and then click to warp to the other map. When merging all of the sectors for each quadrant, we didn't want to have awkward corners and invisible walls you could get snagged on, so each map has had additional sectors added to square off the map and make each map a big rectangle. The Delta Quadrant was already rectangular in nature, so no new sectors were added there. 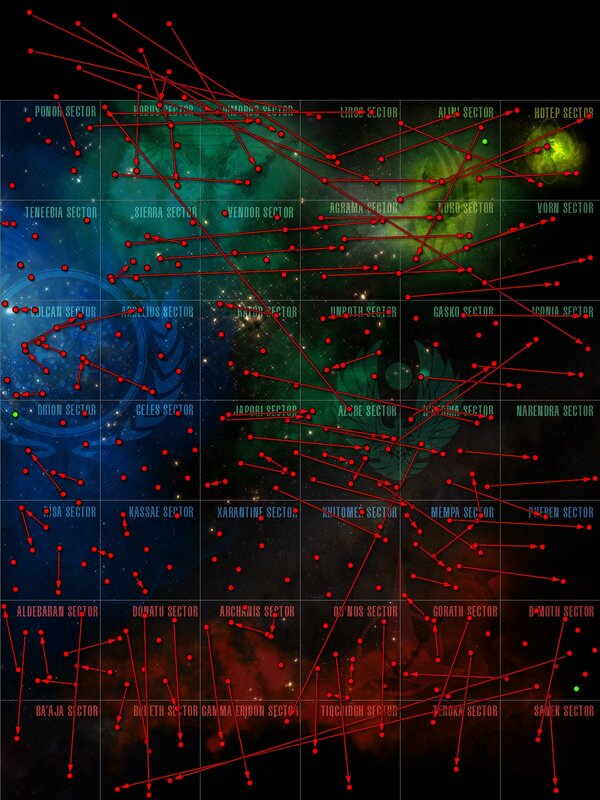 However, the Delta Quadrant sectors were all merged into a single map, just like Alpha and Beta. All of this info was compiled into a giant spreadsheet, which Sean and I used as our master guide as we went through the galaxy, revamping systems. 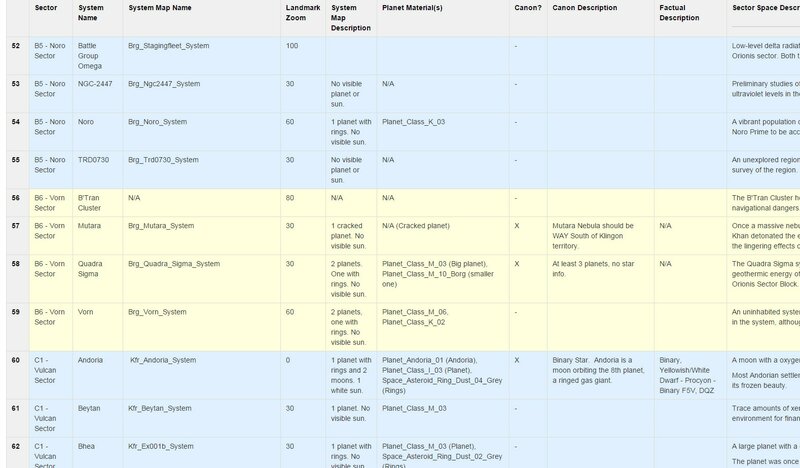 In the end, we have info on more than 350 star systems in that sheet. It's a lot to keep track of. So, what do we move, and where did we move it? Well, if a canon system's location was within the map boundaries, we almost always moved it to that location (with a few exceptions we'll get into in a moment). 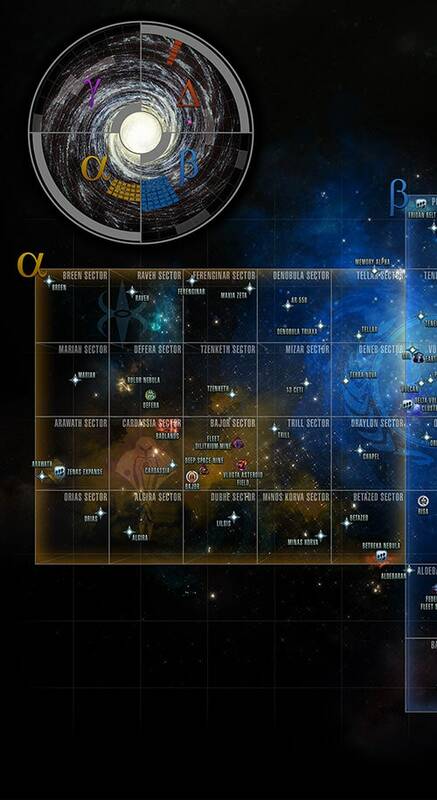 However, there are some canon systems whose locations on the Star Charts map place them outside of the boundaries of our Alpha/Beta Quadrant maps. Many of these (Ferenginar, Iconia, Romulus, Boreth, etc.) lie just outside of the playable space. Most of these systems were generally nudged to just within the border. 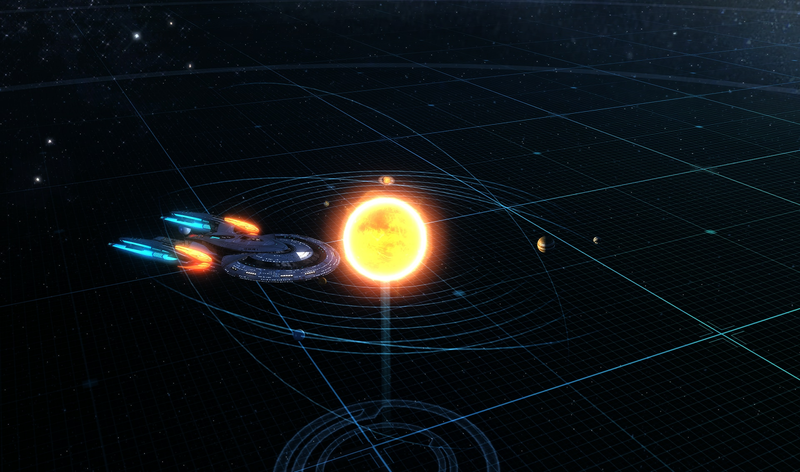 Others that were located multiple sectors away from the playable space were placed in an appropriate playable area. Often these were used to help fill the added sectors. Lastly, there were some canon systems in these new sectors that didn't exist in our game before, but ones that we felt were too important to leave out. 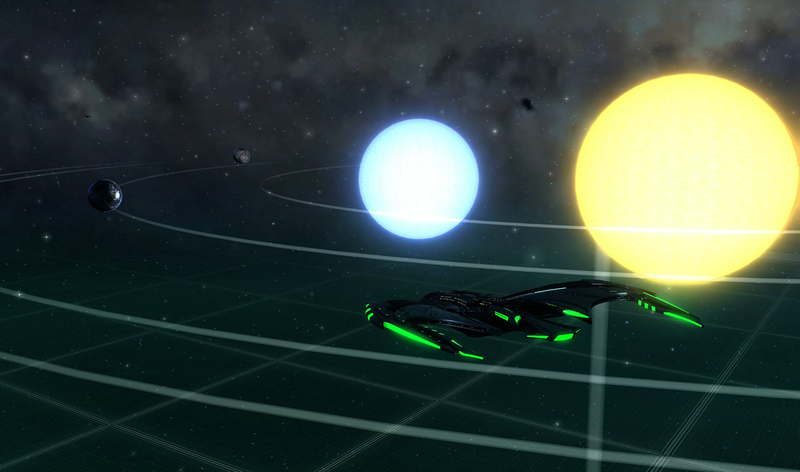 We've added Tellar, Trill, Betazed, and a few other key systems to these new sectors. These systems can be used for future content, and they have had doors added to them for use with the Foundry. There were some canon systems however, which, for gameplay/story reasons could not be moved. 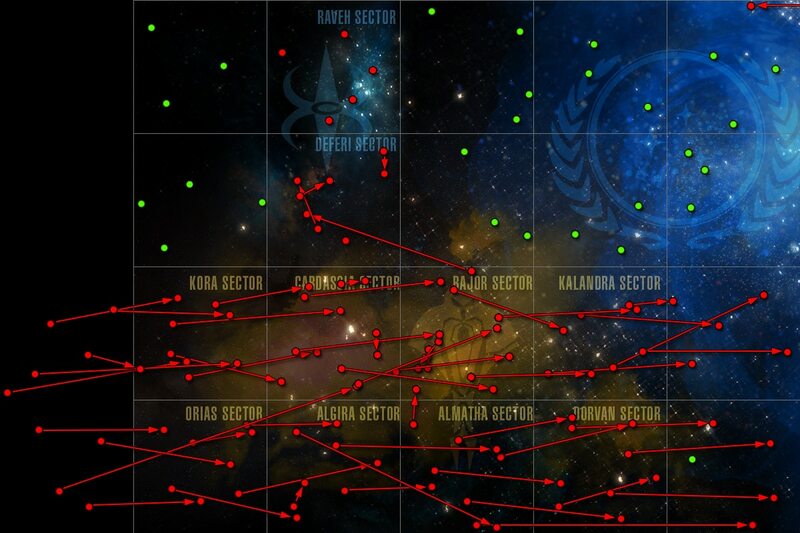 Vega, which according to the Star Charts map should be located in one of the newly added sectors in the Alpha Quadrant, is too important to the early Federation gameplay to be moved from its current location in the Risa Sector. We know about these discontinuities, but decided that while following the Star Charts is nice, it's ultimately not as important as the functionality of the game. Astrometrics has gotten an overhaul. You can still Disable Astrometrics, and fly around in the blackness of space if you'd like, but we wanted to update the graphics to be less obtrusive, and potentially more useful, for those who do fly with them. Firstly, the big, curvy roads that were all over the place and did nothing? Gone. We've had requests to pull these for a while, and it seemed like a no-brainer when we got into it. The Astrometrics for each system hasn't changed a ton. There are still rings indicating the orbits of planets around stars, and there is still a lollypop stick that leads down to the grid. However, the swirling rings at the bottom have been removed. The biggest change is in the grid. As you fly around Sector Space, even now, there is a grid running under all of the systems. Currently, this grid doesn't serve much of a purpose, other than to give you a sense of motion as you fly. This grid changes pattern and color depending on the faction's space you are flying through. The new grid is a bit different. The new grid is the same throughout all factions' space. However, the grid actually means something now. Each major line in the grid is 1 light year from the last. Each sector is 20 light years across (as per canon, and the Star Charts book.) The smaller lines on the grid show Light Months, Light Weeks, and even Light Days. While systems will still tell you how far away they are, you can now also roughly gauge distances by looking at the grid. There is now a larger vertical light wall, to help delineate between sectors. Toward the edges of each sector, the sector name will also appear on the grid. So as you fly around, it should be apparent where you are. 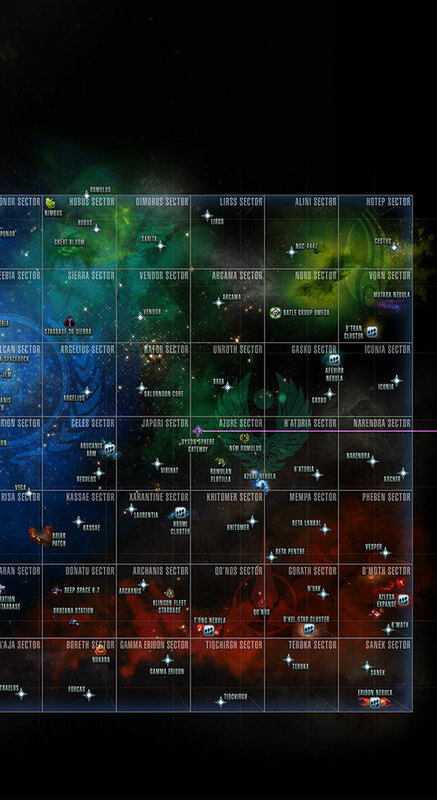 You can always hit 'M' to view the map, which will also display all of the sectors. One of the main goals with the Sector Space Revamp was to improve the feel of flying around in it. We wanted space to feel bigger and more impressive. We wanted you to feel like flying across the galaxy was a feat. And we wanted the systems you came across to feel more like real space. Now, real space is big. Really big. You just won't believe how vastly, hugely, mind-bogglingly big it is. And we really can't do that justice in our game. However, we used a few tricks to make it a little closer than it was. Bottom line; Space is much bigger in relation to your ship than it was. Your Intrepid will no longer dwarf Earth, and space should feel more like SPACE than it did. 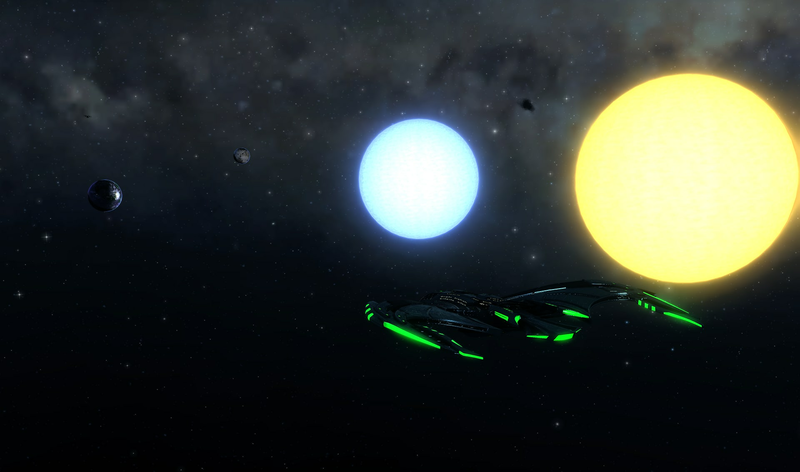 We also changed how planets and stars are rendered. Not only are planets now larger, but they will now also reflect the Planetary System they are supposed to be a part of. That means you won’t see Earth orbiting Acamar, B'Moth, and Cardassia anymore. Each system in Sector Space reflects what is known about that system in canon and how that system looks in game. Where there were disconnects, we’ve favored canon in the hopes that we can fix up those systems at a later date. This means that no two systems in Sector Space will look the same. Planets no longer animate around their stars. At the surface, this may seem less realistic, but planetary motion wouldn’t be perceptible to a Starship’s crew. By turning off movement, however, we can send you to the actual planet you’re going to for a mission, not simply the system. 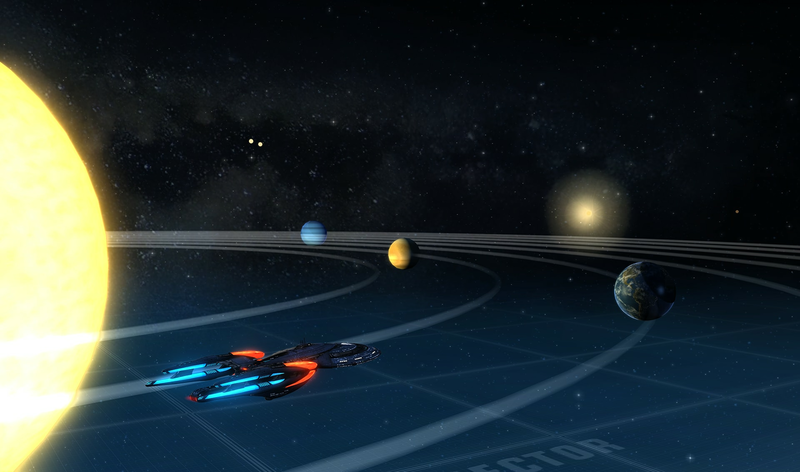 We’ve updated the Foundry to have all doors in Alpha, Beta, and Delta quadrants. I'm sure Foundry Authors will be thinking: "What does this mean for me and my missions?" Our goal is that Foundry users should not have to do major revisions to their missions. 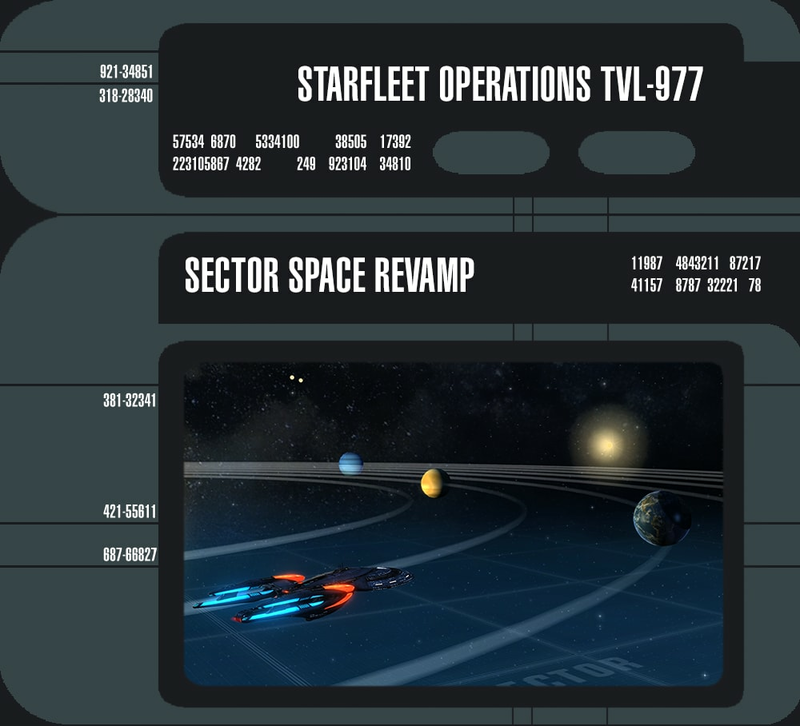 If your mission has a door pointing to the old area of Sector Space, the door will be re-directed to the new Sector Space map. For example, a mission directing the player to go to Qo’noS in our old map will direct players to go to Qo’noS in our new map. Our goal is to make this as painless as possible for Foundry Authors. Missions should work as normal after the update, save for minor text edits Authors will need to make, such as updating directions or removing the words "Sector Block" from text. We can't wait to get you guys flying around the Quadrants!